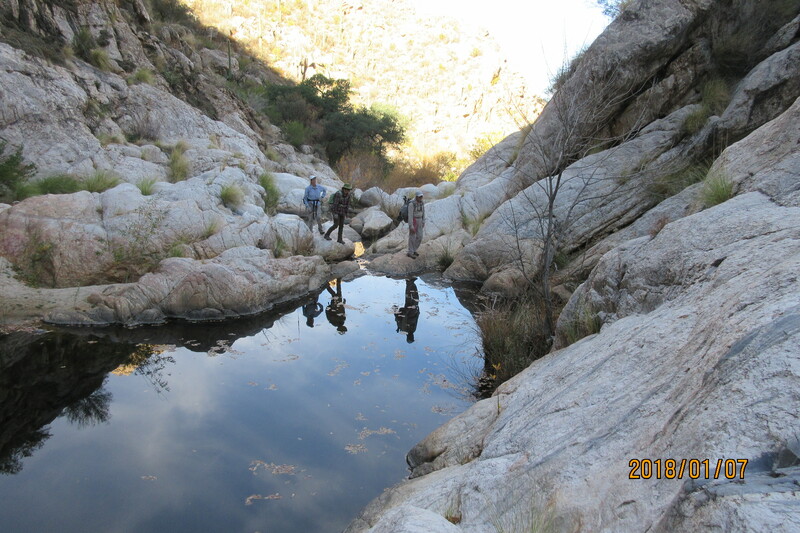 Lower Romero Canyon is an interesting scramble which finishes at the popular Romero Pools. After an initial hike, most of the canyon consists of boulder hopping. However, there are several rock steps that are much more technical, with some class 3 scrambling, a small amount of class 4 scrambling, and depending on how directly you want to ascend the canyon, even some very easy class 5. I did this on 1/7/2018 when there was no flowing water. I suspect the canyon is more difficult – and probably less fun unless you enjoy wading – when water is flowing. Park at the main trailhead in Catalina State Park. Follow the Romero Pools trail for 0.6 miles until the signed Canyon Loop trail heads off to the left. Follow this as it slowly approaches the rocks at the base of the obvious shoulder. After a while the trail splits, with the Canyon Loop sign pointing to the left. A sign on the right-hand branch says “Not a designated trail”. This is the trail you will follow as it contours round the rocks at the base of the shoulder, then descends steeply to the start of Romero Canyon. Follow the canyon bed as it curves left then back right, mainly boulder hopping. Eventually, just as you are wondering if there is anything technical in the canyon, you reach the first of the rock steps. Some of these are easy, class 2 or 3 scrambling, while others have some class 4 moves. 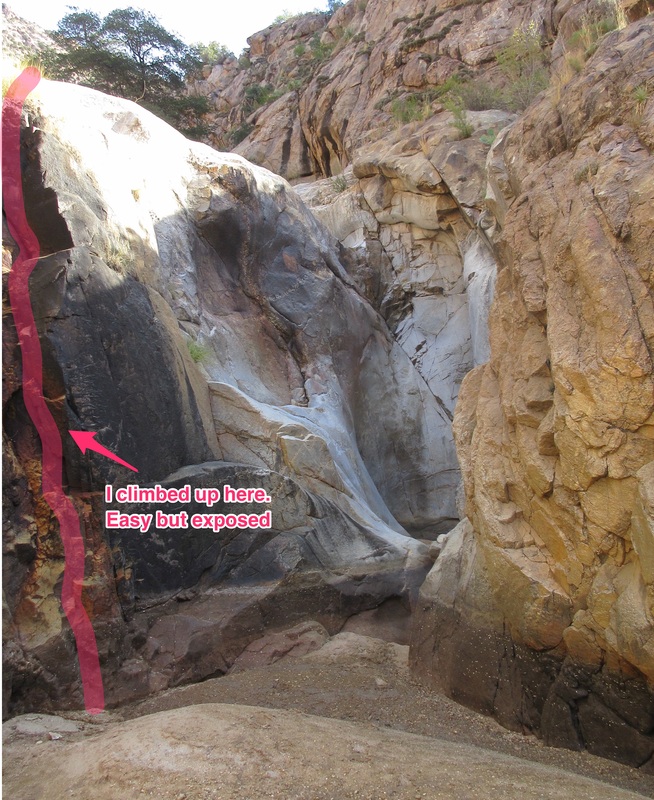 One of the rock steps has steep walls at both sides and a pool with a big boulder at the end – I chimneyed up the right side of the boulder with some class 4 moves. 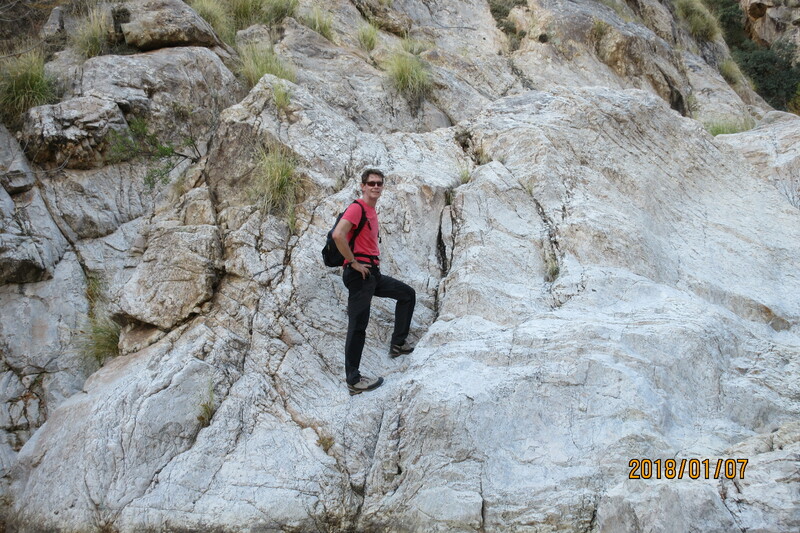 Continue up the canyon until you reach a series of smooth slabs and pools. Pick your way up the slabs until you finally reach Romero Pools. From here, descend the Romero Pools trail back to your car.